European Commissioner for Migration, Home Affairs and Citizenship, Dimitris Avramopoulos, has said that he will brief the European Commission President Jean-Claude Juncker, his fellow Commissioners and other EU Institutions on the Novartis case in a “documented and analytical manner,” as he said. His name is among the ten names of former ministers and prime ministers allegedly involved in the bribery case that stirs the Greek political landscape. After the case file was submitted to the Palriament and the names allegedly involved were made officially public, the people involved as well as political parties representatives were allowed to access the 7,000-page file. The Novartis case file involves an alleged 50 million euros in bribes over 2006-2015. Avramopoulos is named in the case for his tenure as health minister in 2006-2009. Dimitris Avramopoulos was Health Minister from 2006 until 2009. The file case allegations against the former Health Minister are based on the testimony of one of the witnesses. 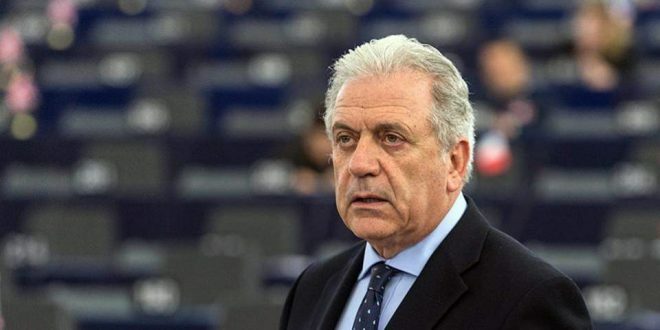 The witness’s testimony as it appeared in the Greek media claims Avramopoulos’ received bribes for the purchases of molecular blood tests for HIV virus in 2006 and the alleged purchase of a huge number of vaccinations against the flu outbreak in 2009. Greek media had claimed that the Greek Health Ministry had purchased the amazingly high number of 16 million vaccines for a country of 1o million residents. The order was cancelled by the next government and Health Minister Mariliza Xenogianakopoulou (PASOK). “Who are the instigators who primed witnesses with false information, and what did they promise them (as reward)?” Avramopoulos said a day earlier. “The fact that (the witnesses) themselves admit that what they claim was not gained first hand but they ‘heard of it’ is yet another proof that confirms their threadbare statements,” he added. Speaking to ANT1 TV on Wed, Avramopoulos said that the price of the vaccines was set by the WHO and the amount was ordered after consultations with the scientific committee. The Novartis case is based on testimonies of witnesses, three of them who are “protected.” The names of 8 former ND and PASOK ministers as well as the name of ex Prime Minister Antonis Samaras (ND) and interim PM Panagiotis Pikrammenos are referred in the case file. Asked whether EC president Jean-Claude Junkcer is briefed about the development such a case could have, Schinas said that Juncker was closely following the developments and was in contact with the Collegium of E Commissioners. Avramopoulos has announced he will hold a press conference with “documents and evidence” on Friday. According to media information the press conference will be held at 12 noon at the offices of the EC representation in Athens. So actually he says he has a sick mind himself! Please tell me what big pharma firm really takes patients’ health into consideration? Since the financial people (number monkeys) have taken over the leadership of all large and medium sized companies what can one expect? It isn’t the doctors, chemists or pharmacologists that are in command. If they wer we might have already had a CURE for cancer, for example, instead of just the more lucrative treatment. The only thing that matters is achieving the budget, by underhanded methods if necessary. Populations should stop being so naive.